I live on the cheapest street on the Monopoly board. Today's party is on the most expensive one. Mayfair is far too posh for public transport, so I have to trundle my trolley bag along Piccadilly, dodging the crowds, and turn into Park Lane until I reach the bijou offices of Hanson Capital, a privately owned merchant banking firm. Annelise is PA to the Chairman, and a fellow volunteer for The Food Chain, and she has invited me to run an after-work party with her colleagues. It is another sweltering day in London, but the impeccably groomed young women look as cool as cucumbers in a FridgeSmart. It might be my poshest location, but Heavens above, the communal kitchen microwave looks like something from Bruce Forsyth's conveyor belt in 1977. I have to adjust the power and the timing just to melt the chocolate for the Chocolate Almond Cake, let alone to cook the thing. But needless to say, the recipe and the flower silicone form are as reliable as ever. The guests throw themselves into the Tupperware buying with gusto and good humour, and even the boss's delightful Filipina housekeeper has been chauffered in to equip her kitchen with whatever she wants. This turns out to be my highest spending party yet which, after an additional contribution from guest Jenny, and Gift Aid from the Chancellor, nets a donation of £220 to The Food Chain. What's more, three of the guests get to add a half-price item of their choice to their order, saving around £50 between them. If I add in Adam's and Laura's recent fundraising parties, my parties have generated around £320 for the charity, and as a volunteer I know this goes a very long way and is much appreciated. During a quick visit to Blackpool at the weekend, I meet up with Marc, the only other Tupperware Man in the country. Younger than me, but an old pro when it comes to Tupperware (and pretty much everything else), Marc gives me the Tupper-gossip in his back garden over ice tea in Expressions tumblers. Sadly, it looks like holiday plans will prevent Marc from attending the Jubilee in September. 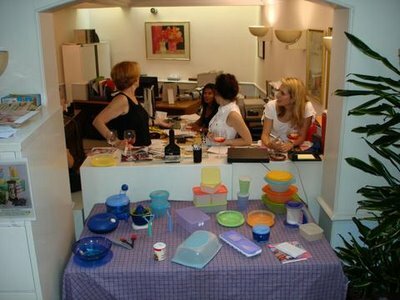 This is the first gathering of Tupperware consultants from all over the country since the company relaunched. I will be the only man there, and will of course be reporting on it for my blog.